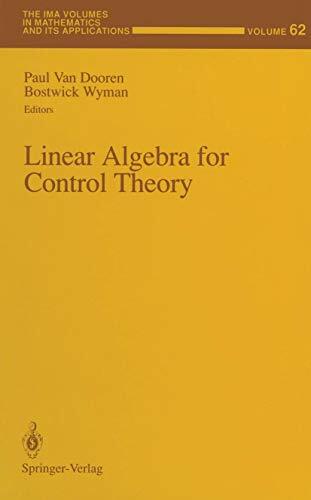 During the past decade the interaction between control theory and linear algebra has been ever increasing, giving rise to new results in both areas. As a natural outflow of this research, this book presents information on this interdisciplinary area. The cross-fertilization between control and linear algebra can be found in subfields such as Numerical Linear Algebra, Canonical Forms, Ring-theoretic Methods, Matrix Theory, and Robust Control. This book's editors were challenged to present the latest results in these areas and to find points of common interest. This volume reflects very nicely the interaction: the range of topics seems very wide indeed, but the basic problems and techniques are always closely connected. And the common denominator in all of this is, of course, linear algebra.<br />This book is suitable for both mathematicians and students.